The solution is simple: DSL-224. The D-Link Wireless N300 4-port VDSL2/ADSL2+ router is all you need for high-speed Internet access for your entire home or office. This compact router combines the functionality of a high-speed VDSL2/ADSL2+ broadband modem and a wireless router in one device, allowing you to share your Internet connection with both wireless and wired devices. This eliminates the need for a separate modem and wireless router which ultimately saves you money, time and effort. The VDSL2/ADSL2+ Wireless N300 4-port router is perfect for the home or office environment. Its high-speed wireless and Fast Ethernet LAN ports give you speedy and reliable wired and wireless connections of up to 300 Mbps. And what’s even more? With built-in NAT firewall, Wi-Fi Protected Setup and WPS/WPA2 encryption you can browse and shop securely knowing your wireless traffic is safe. You may also have noticed this is a VDSL2/ADSL2+ router but wondered what that actually means? VDSL is a newer technology that uses the same ADSL copper lines you may already have running to your home or office. The difference is VDSL uses these lines more efficiently, especially over short distances. This means VDSL can reach speeds of up to 40 Mbps and an average of 6 times faster download and 3 times faster upload speeds. All this makes VDSL a must for HD streaming, video conferencing and the typical needs of a small business. With the innovative DSL-224 wireless router you’ll now be able to utilise this increased bandwidth VDSL has to offer. 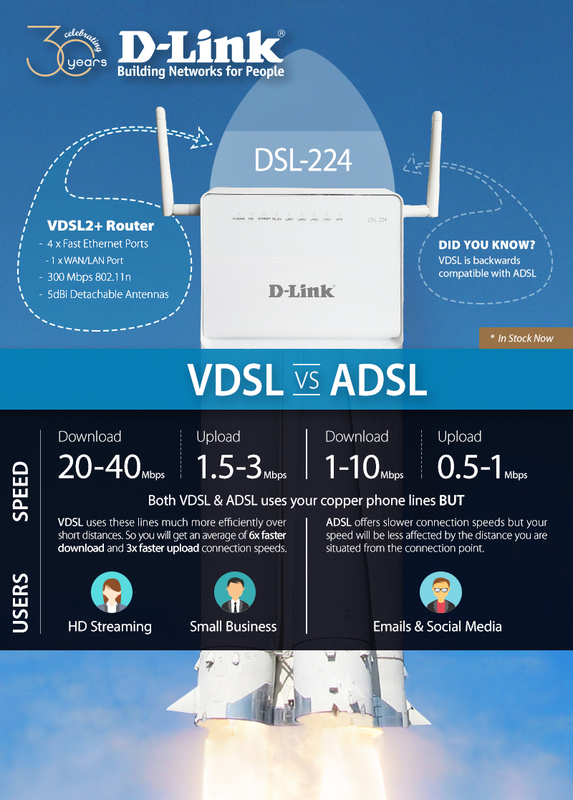 See the VDSL vs ADSL comparison below for a bit more information. With just this one easy-to-set-up DSL-224 you can now enjoy a complete internet solution that lets you connect, share and enjoy the things that matter most to you with the increased speeds of VDSL.